Mini hummingbird cupcakes are moist, flavorful and one-of-a-kind. 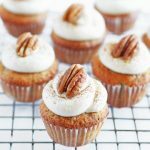 Made with crushed pineapple, banana and pecans, they are simply delicious with cream cheese frosting! Spring has arrived in New York City! The sun is shining, the birds are chirping and I’m baking away. To celebrate the season, I made miniature hummingbird cupcakes. These bite-sized treats are cute and tiny, just like the hummingbird! My first encounter with the hummingbird cake was a year and a half ago when I made the cake for my dad’s birthday. The recipe was first published in Southern Living in the 1970s and has become one of the magazine’s most sought after recipes, with good reason. The cake is darn good! Made with crushed pineapple, banana and pecans, hummingbird cupcakes are moist, flavorful and one-of-a-kind. The batter uses cinnamon, which gives the cupcakes a spice cake quality. I dusted extra on top of the homemade cream cheese frosting, which is garnished with pecan halves. With all those healthy ingredients, hummingbird cupcakes could almost pass as healthy, right? I mean they are bite-sized… and have fruit. I think I’ve made my point. Enjoy! Preheat oven to 350° F. Line a mini cupcake tin with cupcake liners. Combine flour, baking soda, salt, sugar and ground cinnamon in a large bowl; add eggs and oil, stirring until dry ingredients are moistened. (Do not beat.) Stir in vanilla, pineapple, 1 cup pecans, and bananas. Fill prepared cupcake liners halfway with batter. Bake at 350° for 14 to 16 minutes or until a wooden pick inserted in center comes out clean. Cool in pans on wire racks 10 minutes; remove cupcakes from pans, and cool completely on wire racks. To make cream cheese frosting, beat cream cheese and butter on medium speed until smooth. Gradually add powdered sugar on low speed until light and fluffy. Stir in vanilla and cinnamon. Transfer to a frosting bag fitted with a frosting tip. Frost cupcakes and garnish with a pecan half. Store in an airtight container at room temperature. For gluten-free cupcakes, replace flour with GF oat flour. 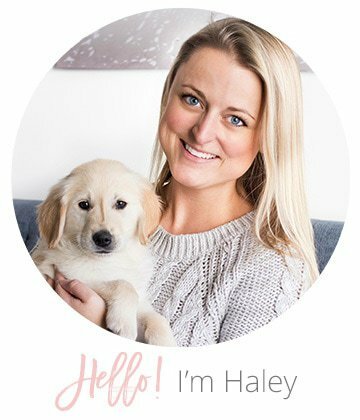 Wow, Haley, these look incredible! I’m marveling over how light, bright, and sharp that first photo especially is…it’s like the cupcake is really sitting right there in front of me! I’ve never had hummingbird cake but I’ve been wanting to try it. It said to leave these cupcakes at room temperature not refrigerate. They won’t spoil with the cream cheese? They look delicious.. can’t wait to make them. Said 30 servings, does this recipe make 30 mini cupcakes? Would like to know before I start, please. Hi Haley, the cupcakes looks very lovely. I am going to make them for our group of ladies and would like to know how many would this recipe make, Could you let me know and please carry on baking. Hi there! This recipe makes 30 mini cupcakes. Enjoy!